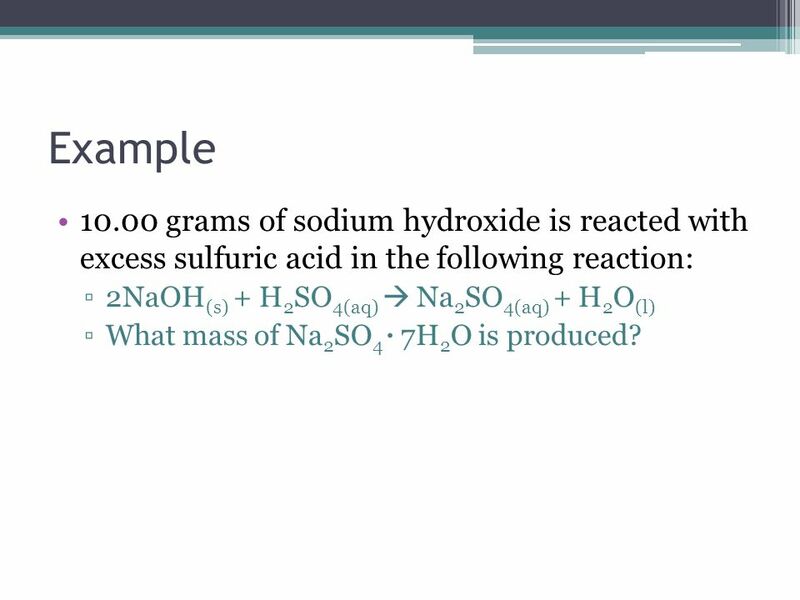 4 Example 10.00 grams of sodium hydroxide is reacted with excess sulfuric acid in the following reaction: 2NaOH(s) + H2SO4(aq)  Na2SO4(aq) + H2O(l) What mass of Na2SO4 · 7H2O is produced? 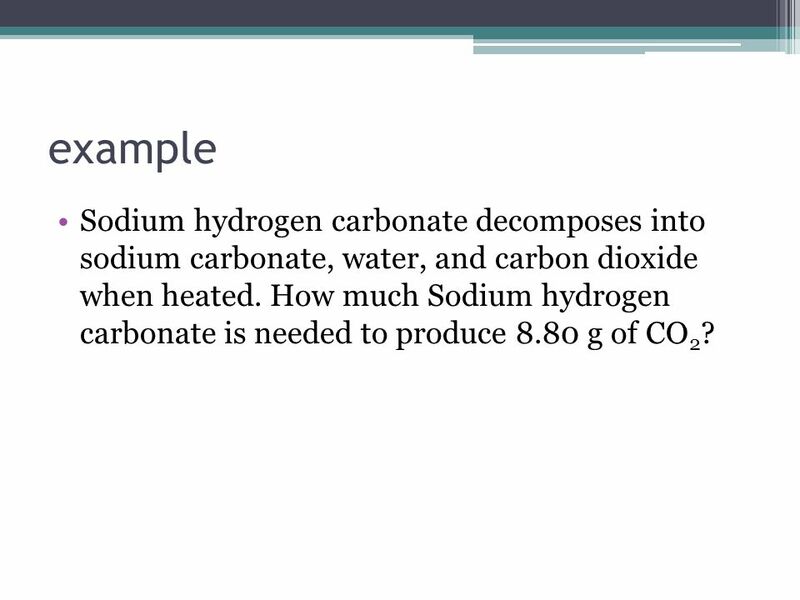 5 example Sodium hydrogen carbonate decomposes into sodium carbonate, water, and carbon dioxide when heated. How much Sodium hydrogen carbonate is needed to produce 8.80 g of CO2? 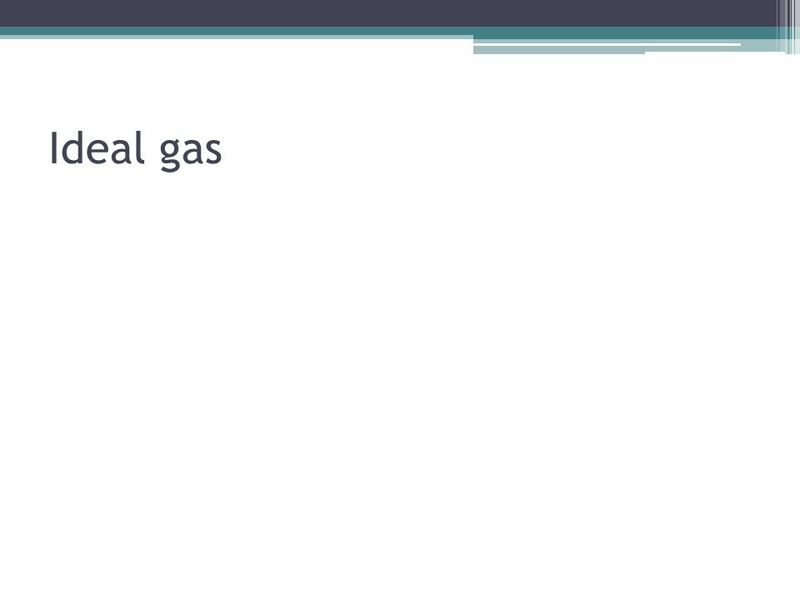 6 example How much oxygen gas is required for the complete combustion of .250 mol. 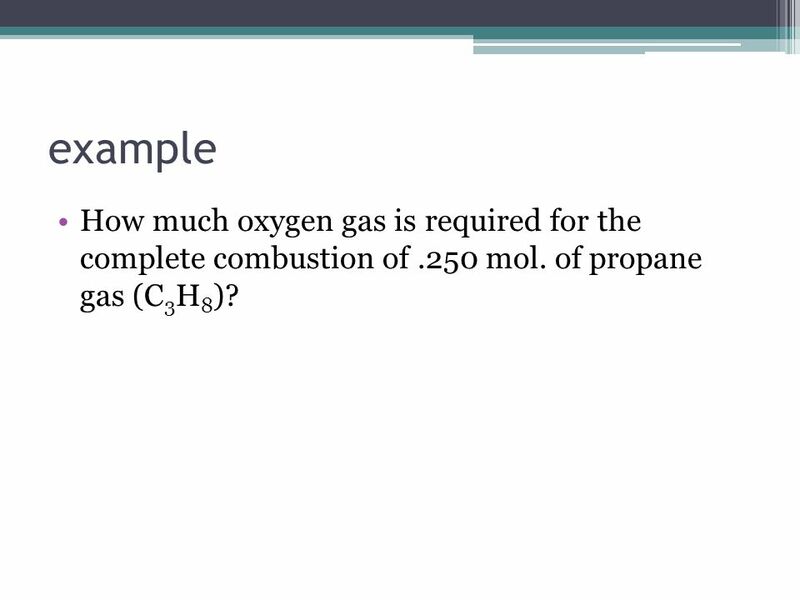 of propane gas (C3H8)? 7 example Solid lithium hydroxide is used to remove carbon dioxide from the environment. The products are solid lithium carbonate and liquid water. 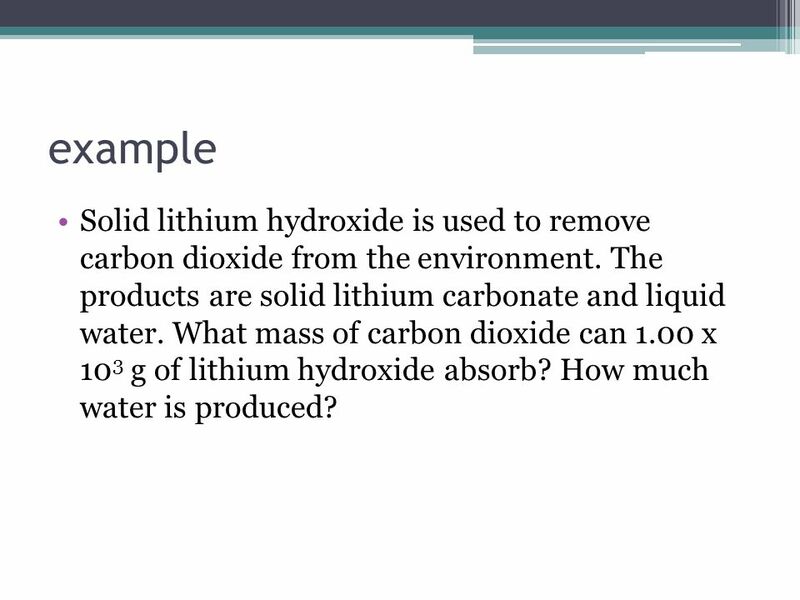 What mass of carbon dioxide can 1.00 x 103 g of lithium hydroxide absorb? How much water is produced? 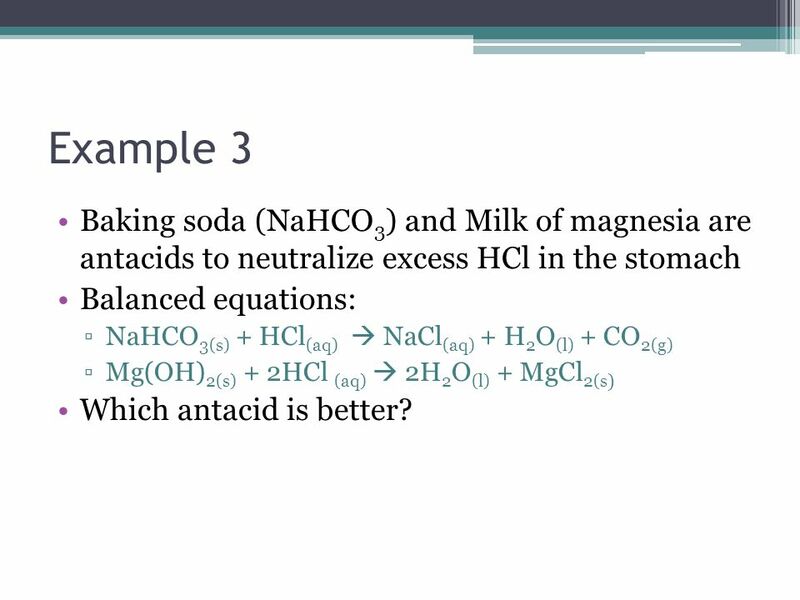 8 Example 3 Baking soda (NaHCO3) and Milk of magnesia are antacids to neutralize excess HCl in the stomach Balanced equations: NaHCO3(s) + HCl(aq)  NaCl(aq) + H2O(l) + CO2(g) Mg(OH)2(s) + 2HCl (aq)  2H2O(l) + MgCl2(s) Which antacid is better? 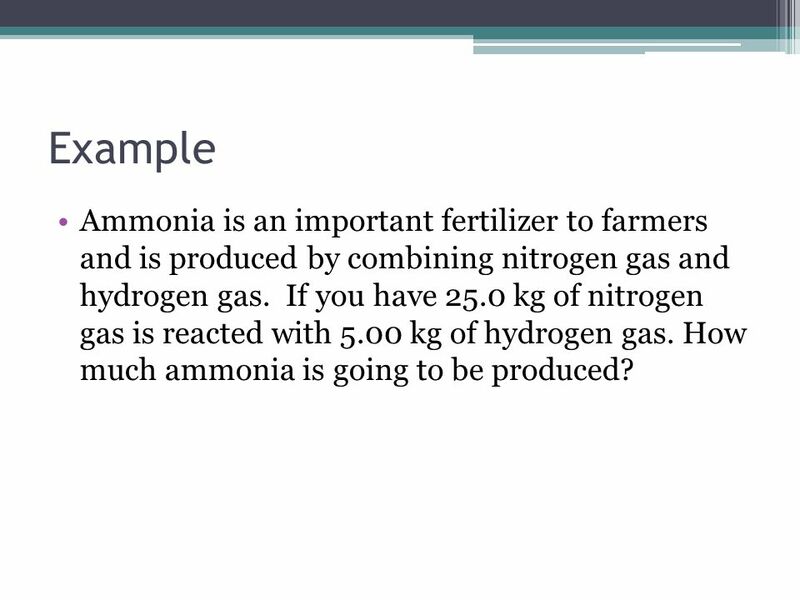 11 Example Ammonia is an important fertilizer to farmers and is produced by combining nitrogen gas and hydrogen gas. 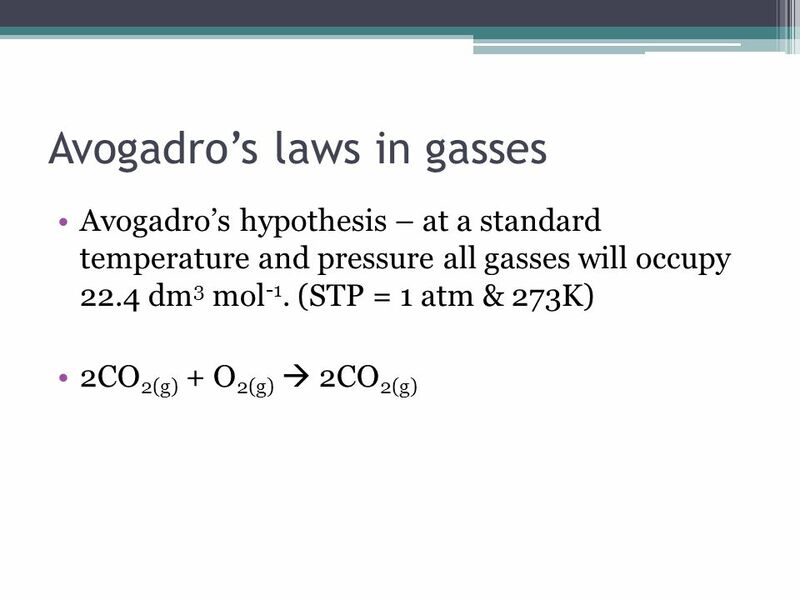 If you have 25.0 kg of nitrogen gas is reacted with 5.00 kg of hydrogen gas. How much ammonia is going to be produced? 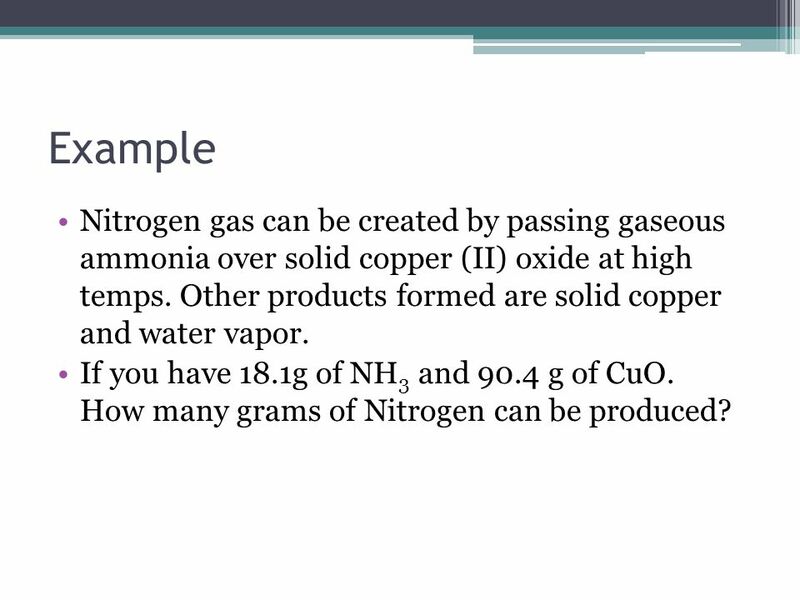 13 Example Nitrogen gas can be created by passing gaseous ammonia over solid copper (II) oxide at high temps. Other products formed are solid copper and water vapor. If you have 18.1g of NH3 and 90.4 g of CuO. How many grams of Nitrogen can be produced? 14 Do we get all that product? Why? 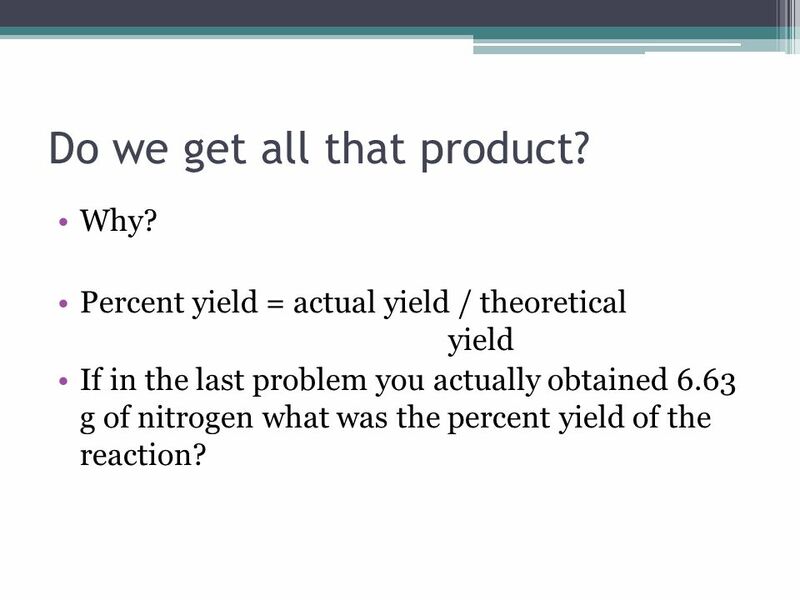 Percent yield = actual yield / theoretical yield If in the last problem you actually obtained g of nitrogen what was the percent yield of the reaction? 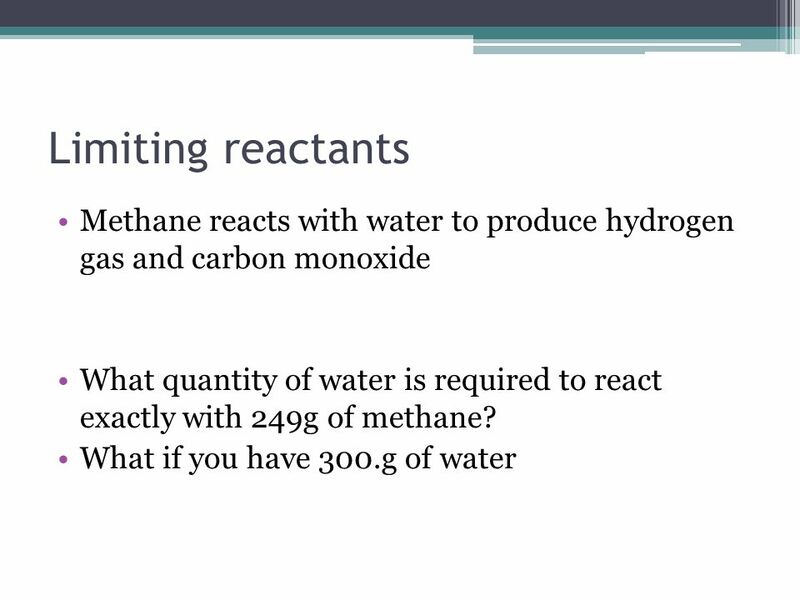 15 Example 68.5 kg of CO(g) is reacted with 8.60 kg of H2(g) to form methanol (CH3OH). 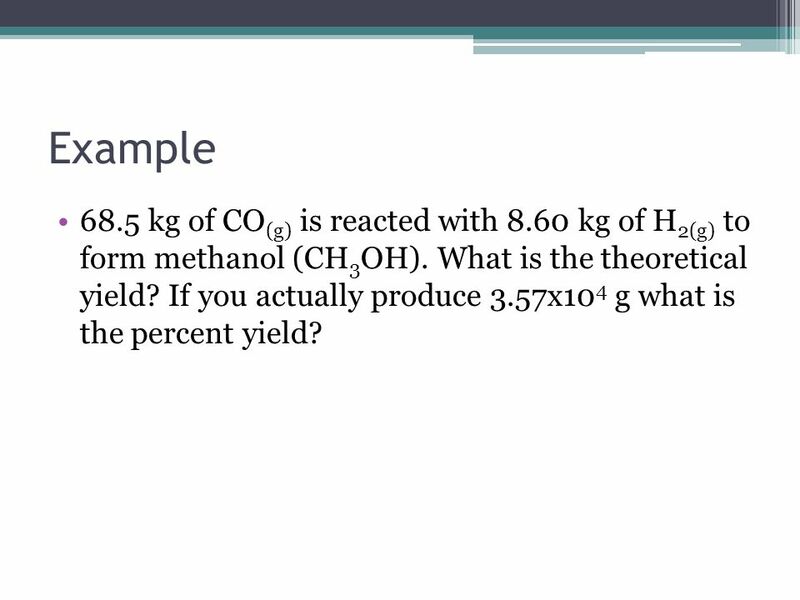 What is the theoretical yield? If you actually produce 3.57x104 g what is the percent yield? 16 Example Lithium nitride is prepared by the reaction of lithium metal and nitrogen gas. 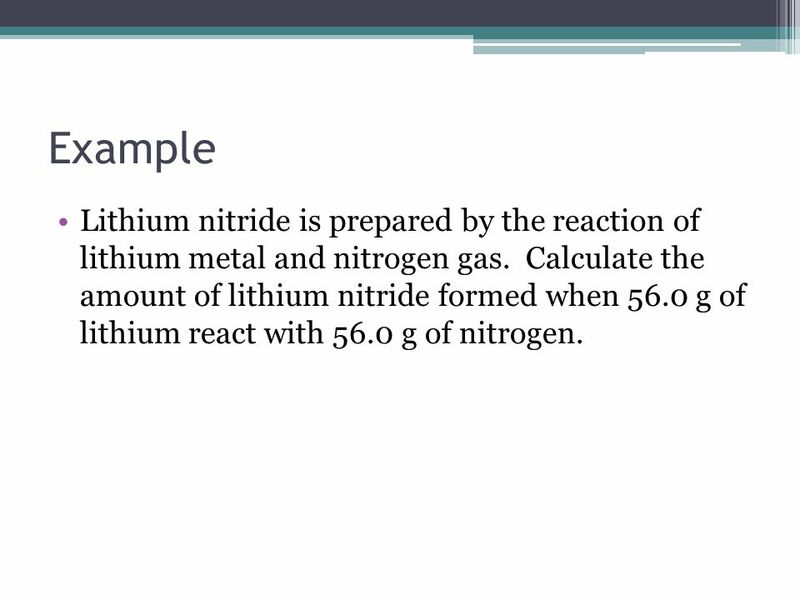 Calculate the amount of lithium nitride formed when 56.0 g of lithium react with 56.0 g of nitrogen. 17 Example Titanium (IV) oxide is a solid white used as a coloring pigment is made by reacting gaseous titanium (IV) chloride with oxygen gas. 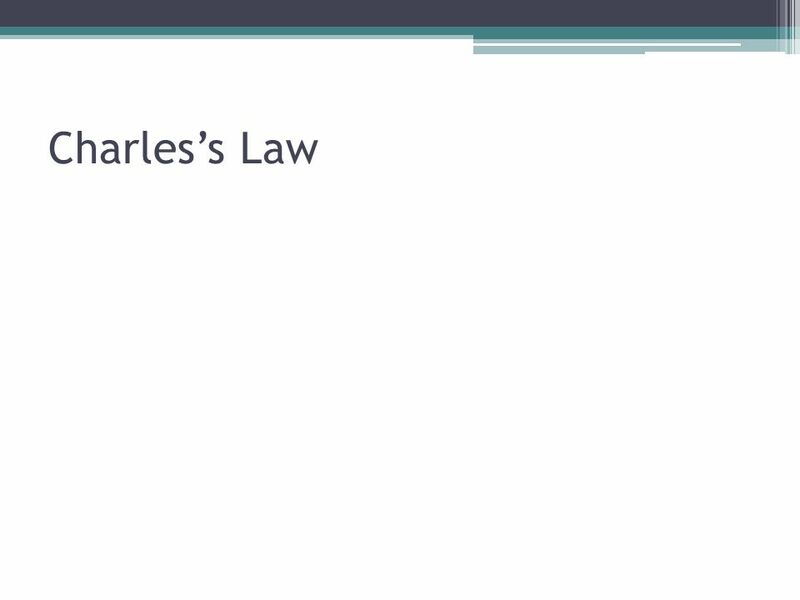 Chlorine gas is also formed as a by-product. If 6.71x103 g of titanium (IV) chloride is reacted with 2.45x103 g of oxygen, how much titanium (IV) oxide can be produced? 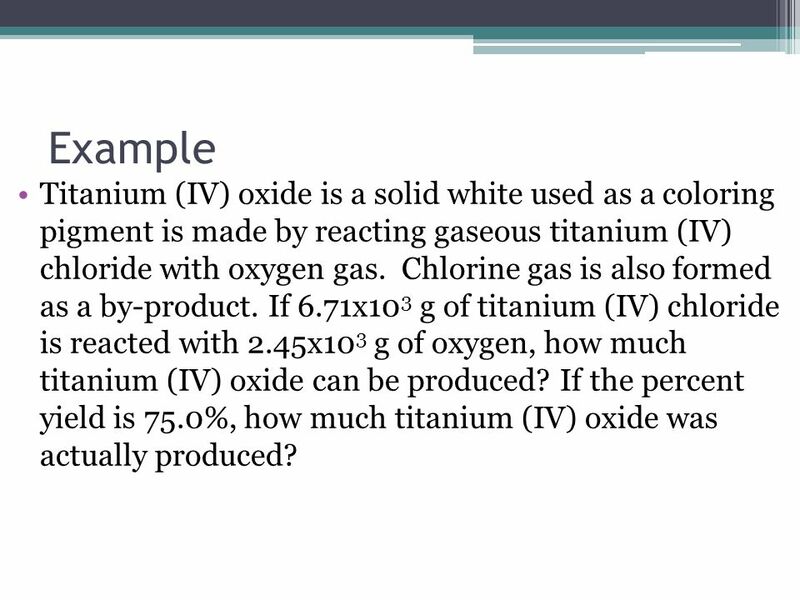 If the percent yield is 75.0%, how much titanium (IV) oxide was actually produced? 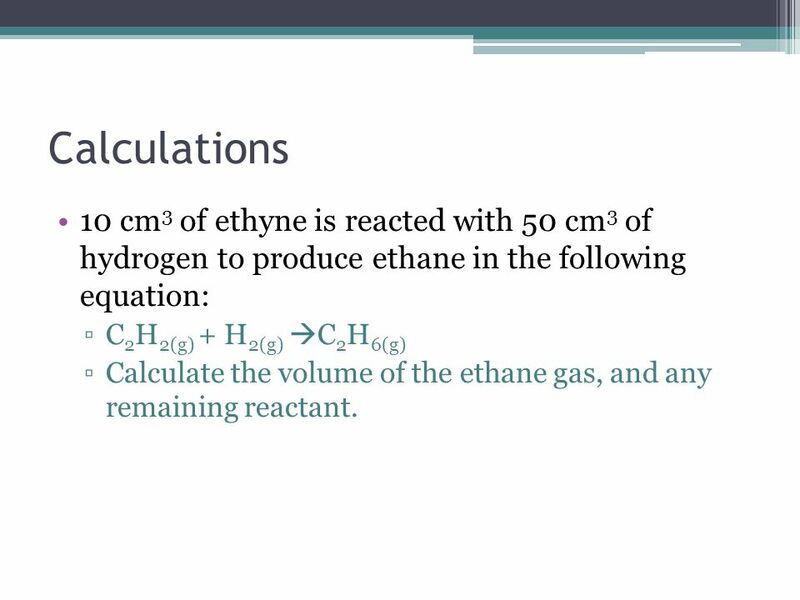 19 Calculations 10 cm3 of ethyne is reacted with 50 cm3 of hydrogen to produce ethane in the following equation: C2H2(g) + H2(g) C2H6(g) Calculate the volume of the ethane gas, and any remaining reactant. 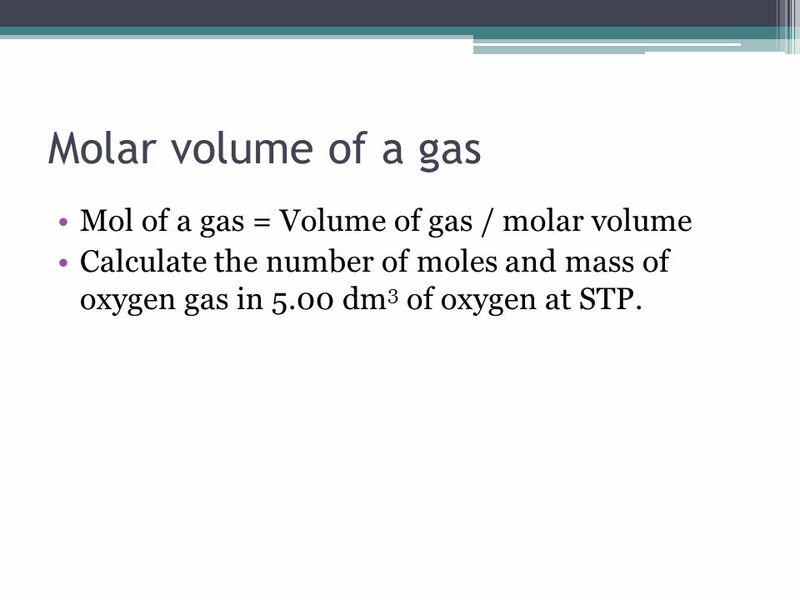 Calculate the number of moles and mass of oxygen gas in 5.00 dm3 of oxygen at STP. 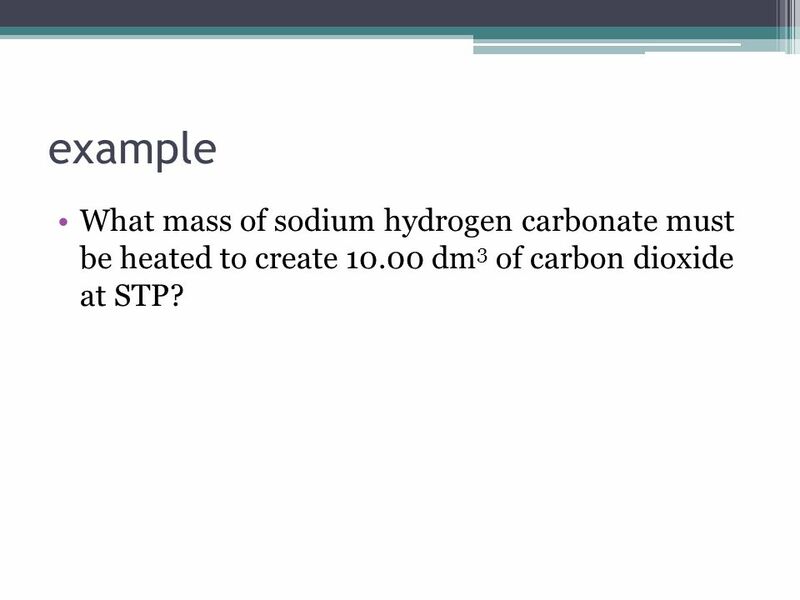 21 example What mass of sodium hydrogen carbonate must be heated to create dm3 of carbon dioxide at STP? 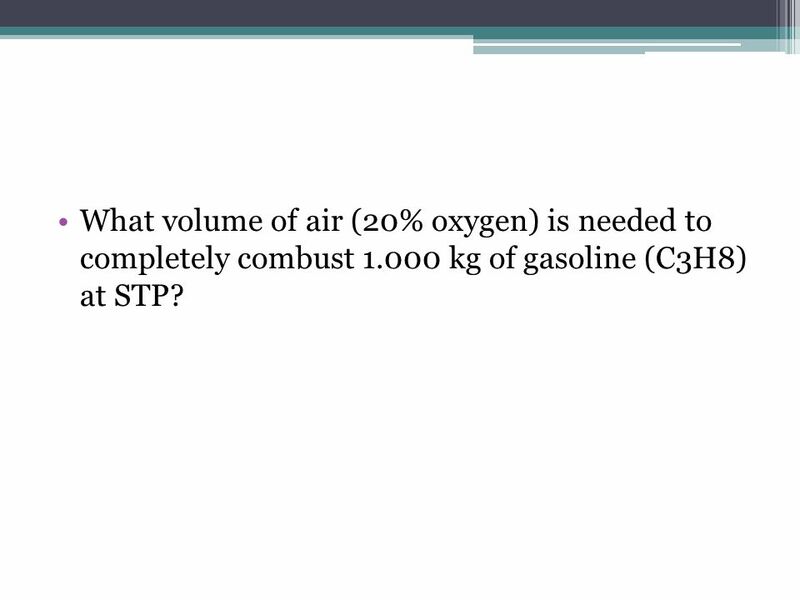 What volume of air (20% oxygen) is needed to completely combust kg of gasoline (C3H8) at STP? 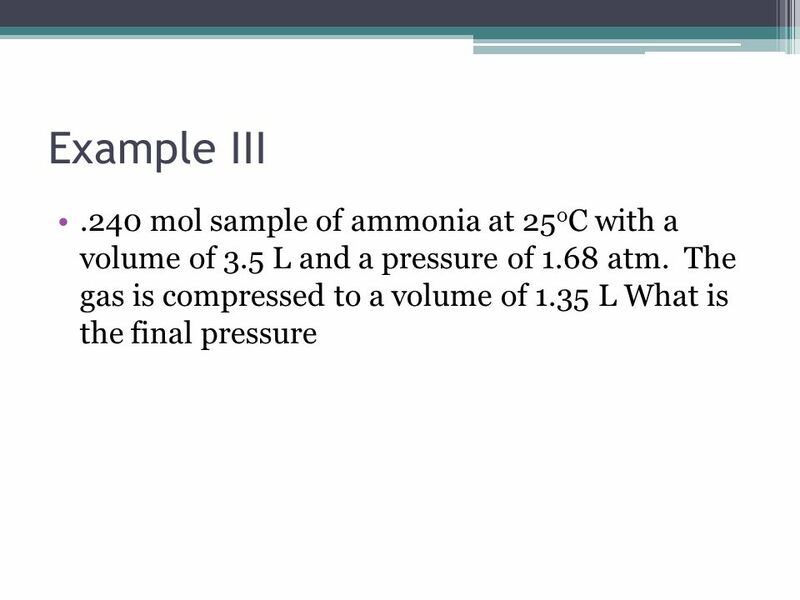 25 Examples What is the new volume of 1.5 L sample of Freon –12 at 56 torr compressed to 150 torr? In an automobile the initial volume of an engine cylinder is .725 L and an initial pressure of 1 atm. 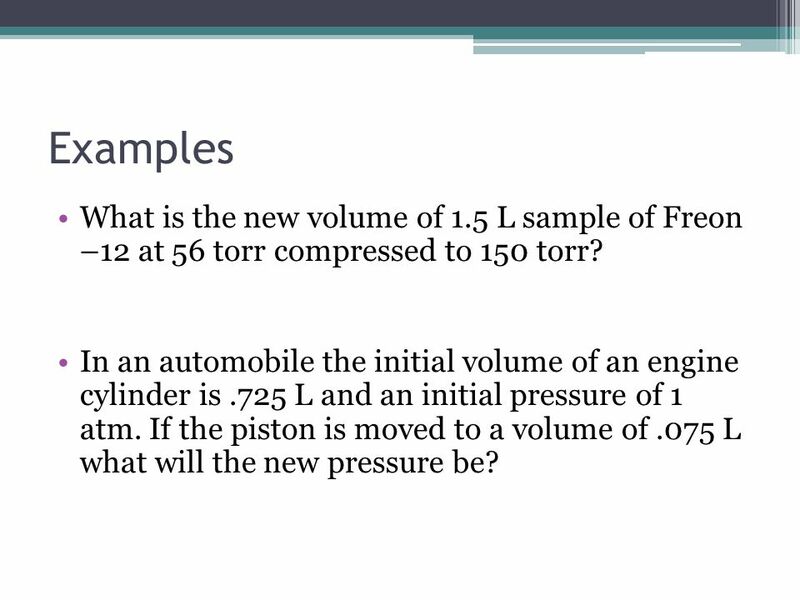 If the piston is moved to a volume of .075 L what will the new pressure be? 27 Example A 2.0 L sample of air is collected at 298 K and cooled to 278 K, what is the new volume? 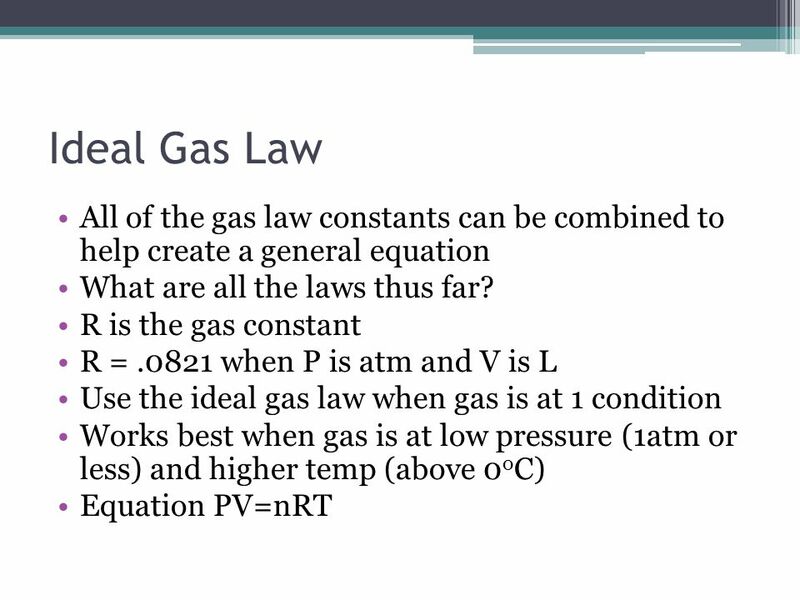 A gas has an original volume of .675L and a temp. of 35.0 oC. 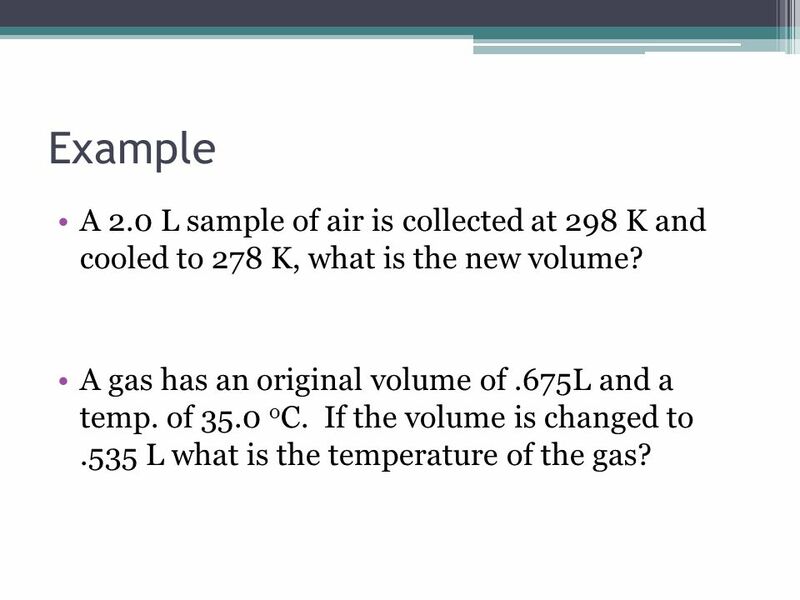 If the volume is changed to L what is the temperature of the gas? 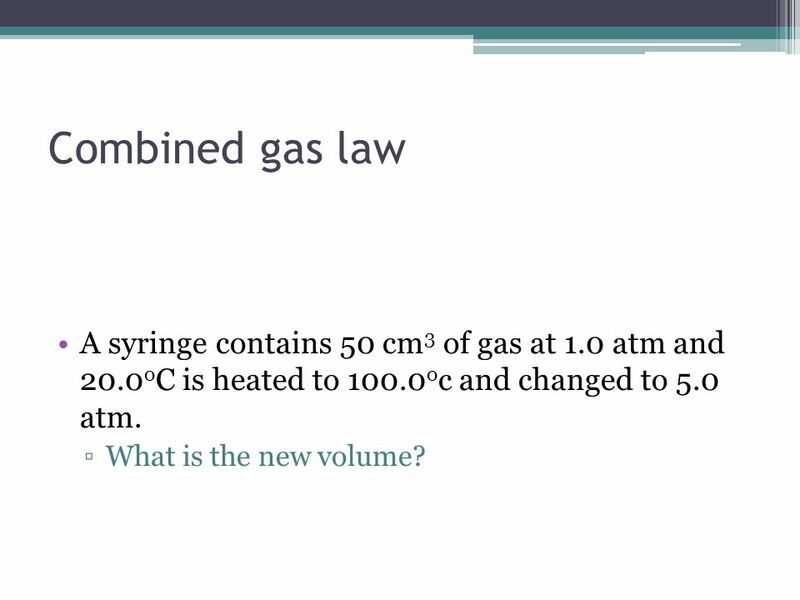 29 Combined gas law A syringe contains 50 cm3 of gas at 1.0 atm and 20.0oC is heated to 100.0oc and changed to 5.0 atm. What is the new volume? 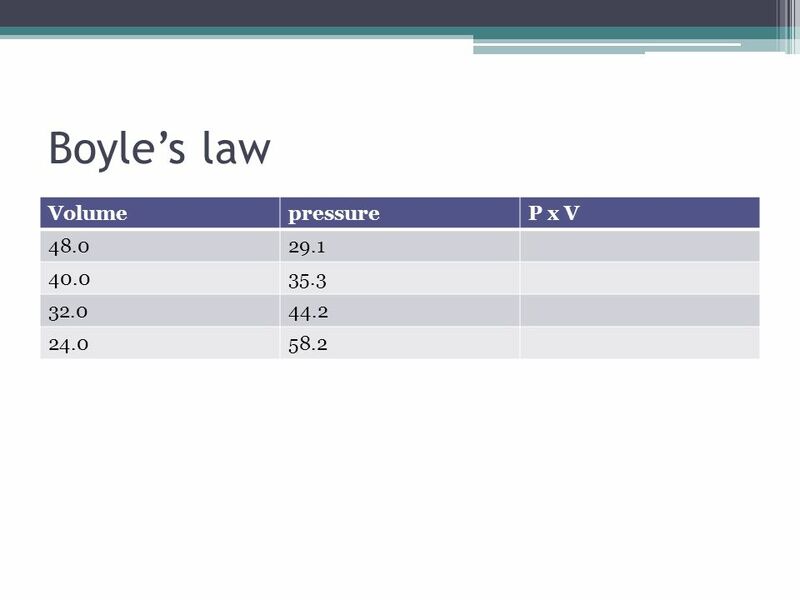 31 Example A sample of hydrogen gas has a volume of 8.56 L at 0oC and a pressure of 1.5 atm. 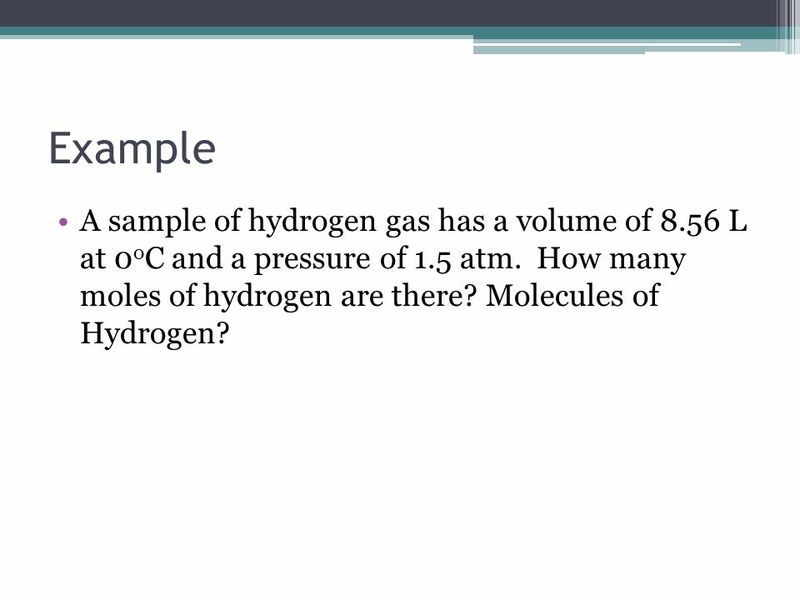 How many moles of hydrogen are there? Molecules of Hydrogen? 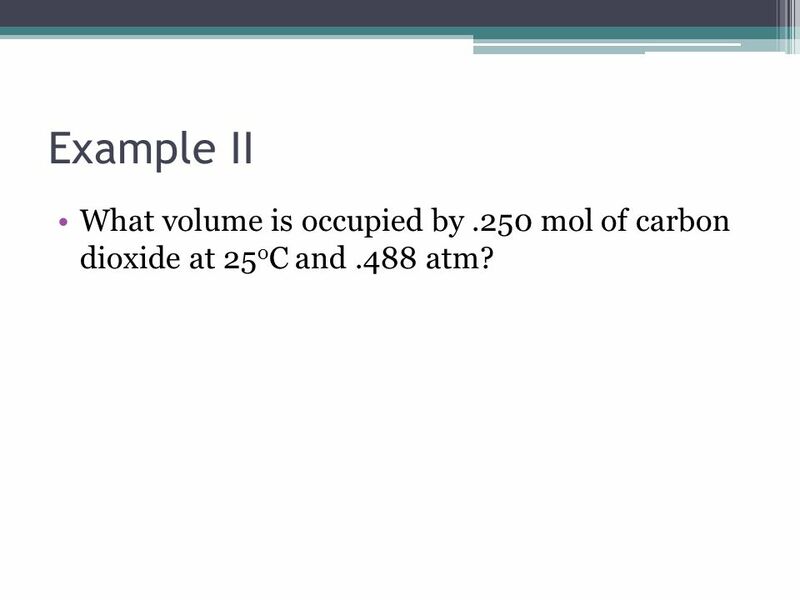 32 Example II What volume is occupied by .250 mol of carbon dioxide at 25oC and .488 atm? 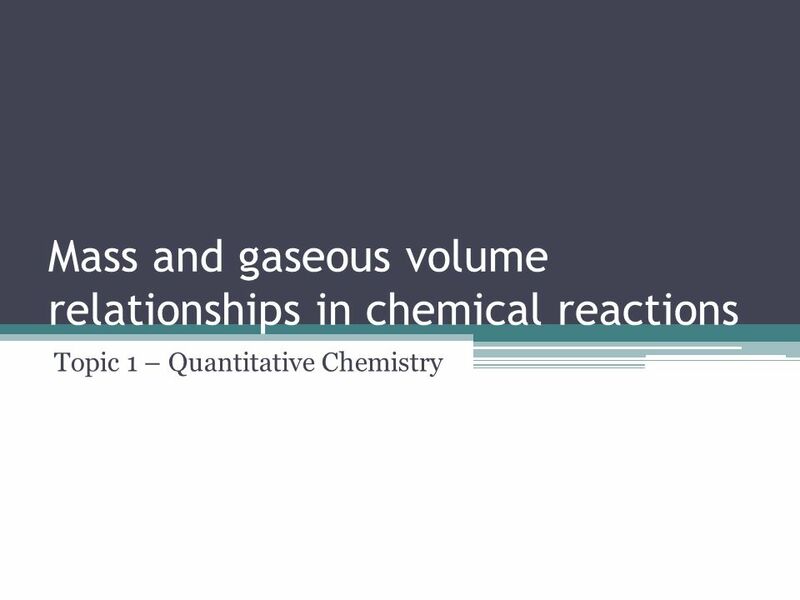 Download ppt "Mass and gaseous volume relationships in chemical reactions"
Topic 16 Access Code: EC787C089C. 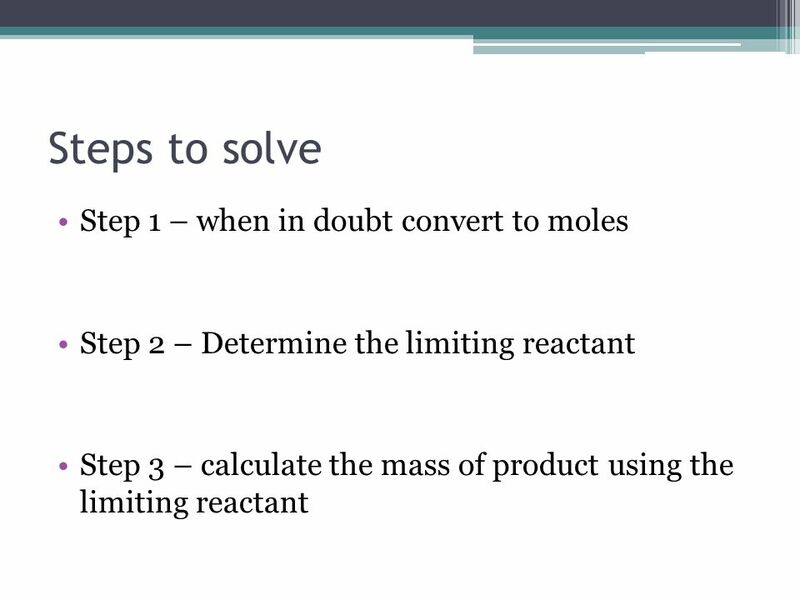 Stoichiometry The Mole: Review A counting unit A counting unit Similar to a dozen, except instead of 12, its 602,000,000,000,000,000,000,000 Similar. 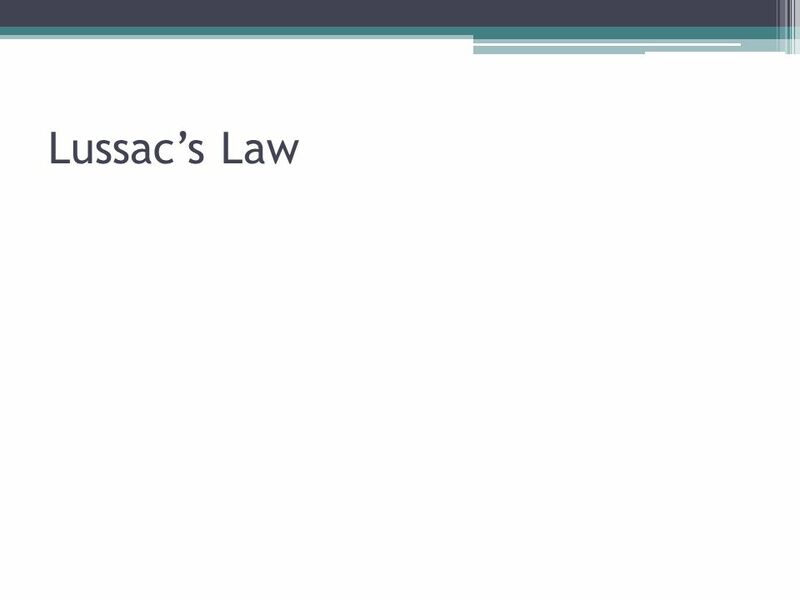 The Gas Laws Chapter 14 Chemistry. 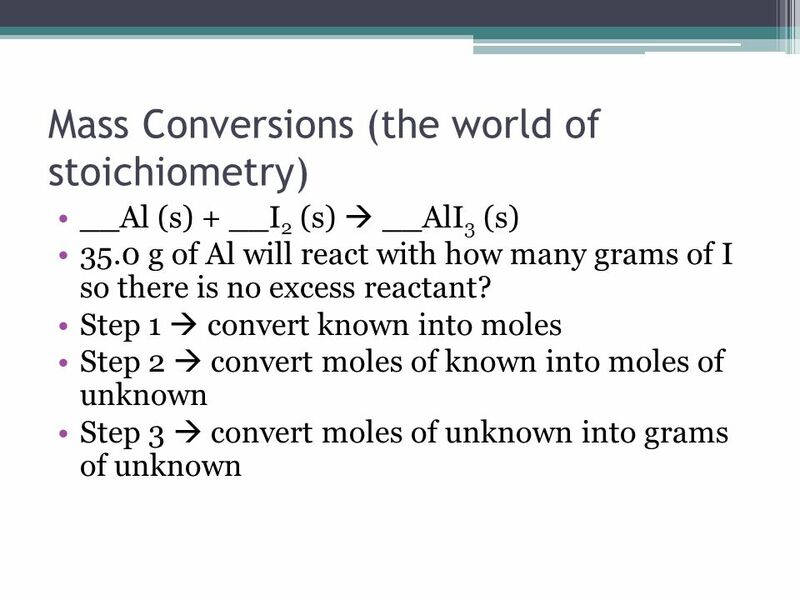 Stoichiometry Chemistry 6.0. 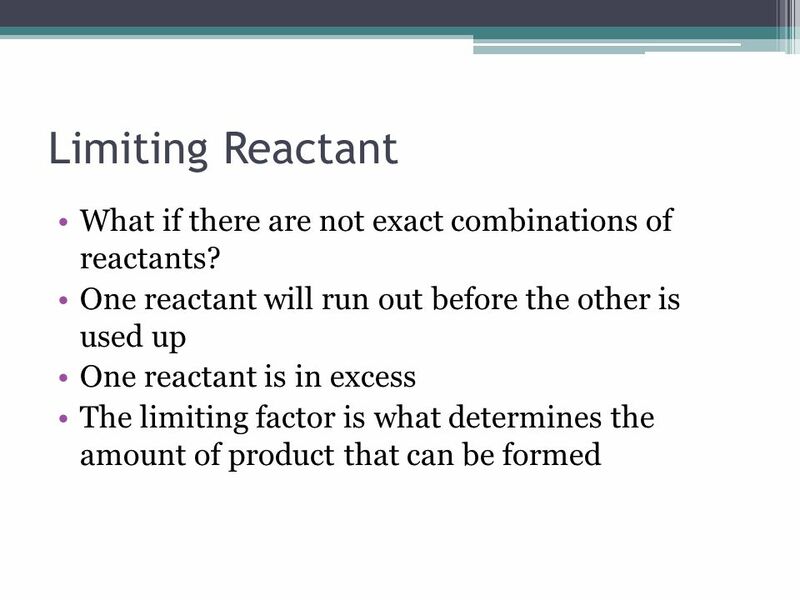 The Mathematics of Chemical Reactions: STOICHIOMETRY I. Balanced Chemical Equations A. Provide qualitative and quantitative. TIER 6 Combine the knowledge of gases and solutions to perform stoichiometric calculations. 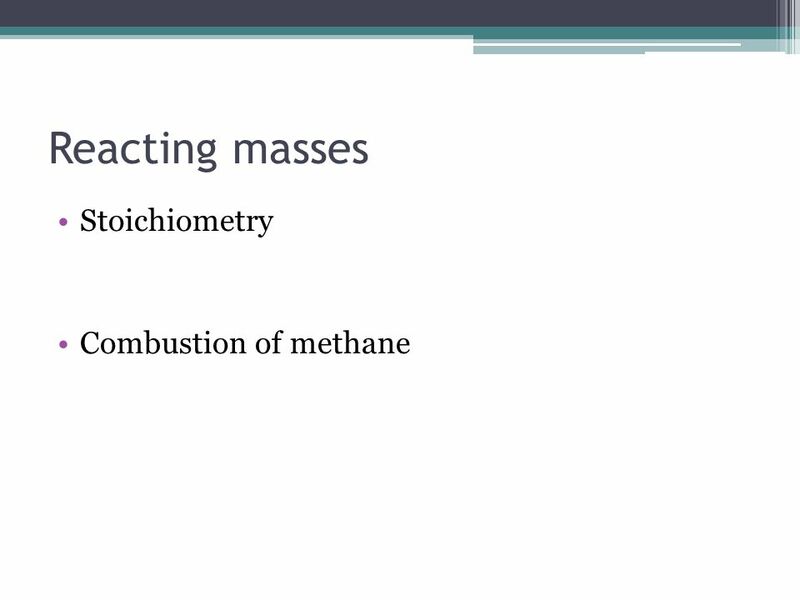 Stoichiometry Chapter 3. Atomic Mass 1961: Atomic Mass is based on 12 C 1961: Atomic Mass is based on 12 C 12 C is assigned a mass of EXACTLY 12 AMU 12.